Average temperatures have ranged from 5°F above normal to more than 11°F above normal. 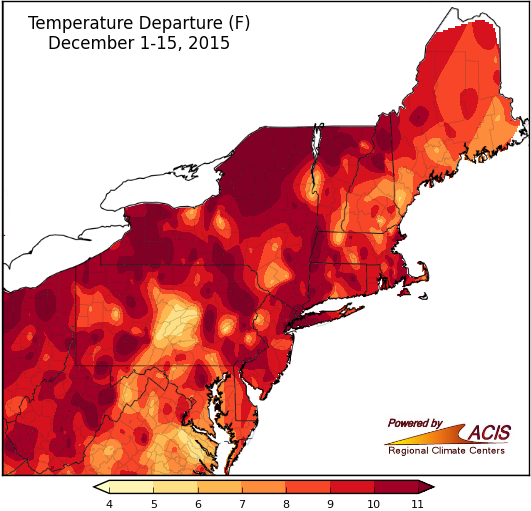 It hasn’t really felt like December in the Northeast as temperatures have generally been 8°F to 12°F above normal. Of the region’s 35 major airport climate sites, 19 have had a record warm first half of December! 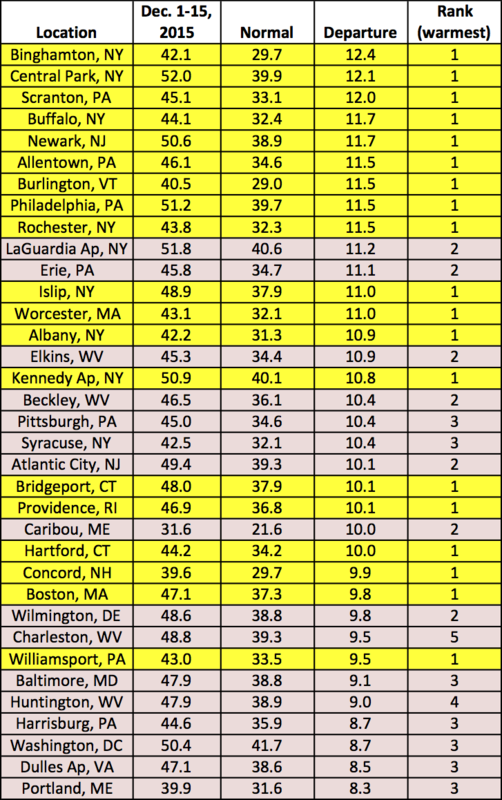 And, another 14 sites ranked it as their second or third warmest. December 12-15 was particularly warm, with some areas up to 30°F above normal! Those highs, in the 60s and 70s, are reminiscent of September or October. Numerous sites had a record warm start to the month. Snowfall has been below normal for the entire region. With such warm temperatures, snowfall has been nonexistent for many areas. 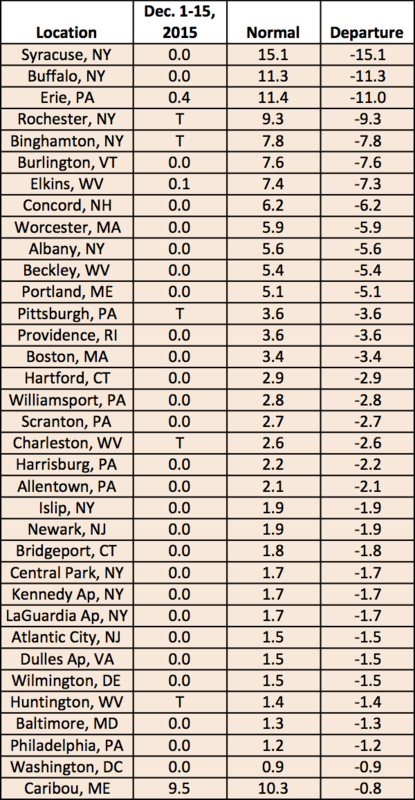 Lake-effect prone regions and the higher elevations of New York and northern New England have the largest departures, with some spots more than a foot below normal. Caribou, ME is still the only airport climate site to see its first inch of snow. Several sites are approaching one of their top 3 latest first inches of snow on record. 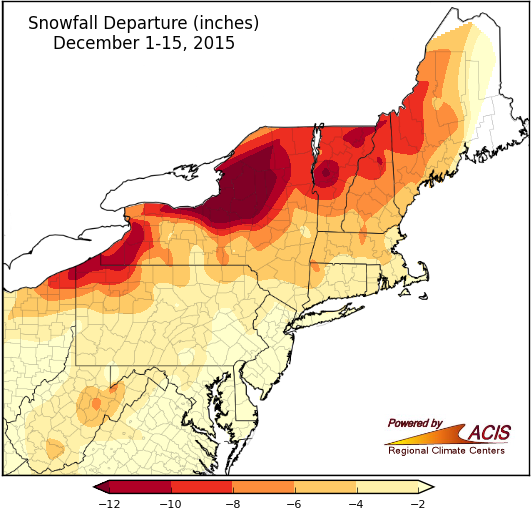 Only three airport climate sites have seen measurable snow (0.1 inches) this December. Precipitation so far has ranged from less than 25% of normal to 200% of normal. 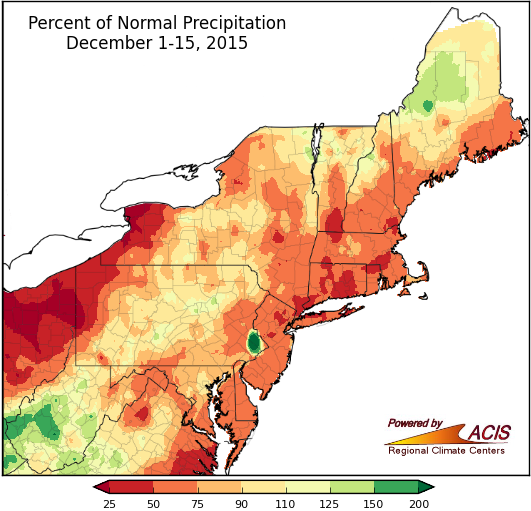 Most of the region has also seen near to below-normal precipitation, generally from 50% of normal to 110% of normal. The driest spots were in western New York and western Pennsylvania, which saw less than 25% of normal. Areas of abnormal dryness and moderate drought continue to linger across the region. 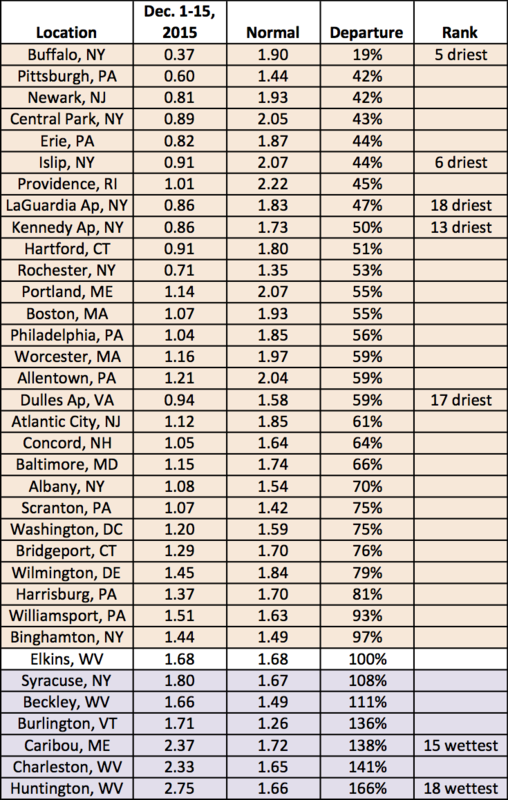 Precipitation ranged from 19% of normal to 166% of normal at the airport climate sites.